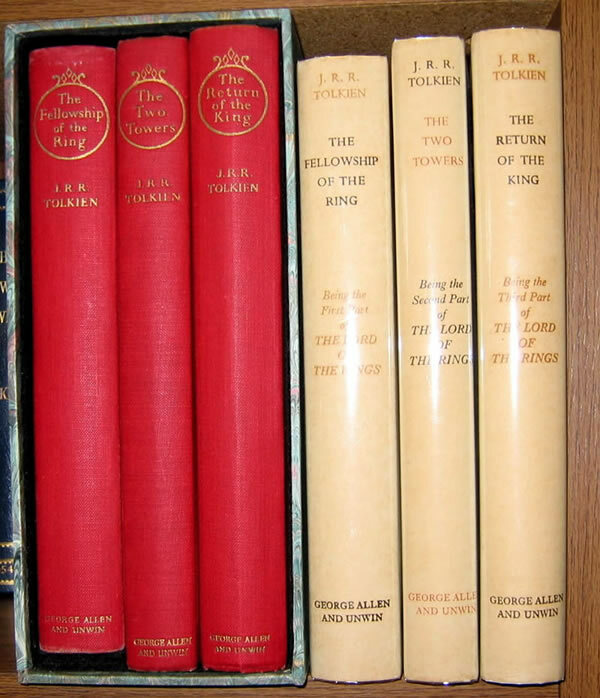 Signed 1st UK Lord of the Rings - 2nd/2nd/1st impressions - SOLD George Allen & Unwin, 1954/55/55 1st UK Edition. George Allen & Unwin, 1954/55/55 1st UK Edition. 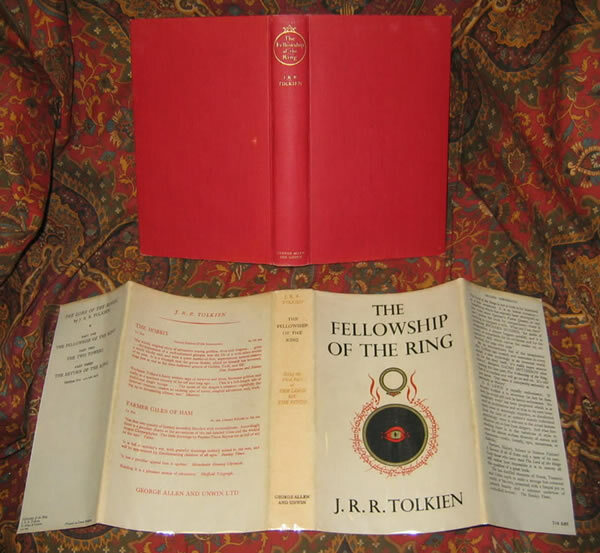 The Fellowship of the Ring is a 2nd impression, signed on the title page by J.R.R.Tolkien, with his distinctive, flourished, signature. This 2nd impression was published in December 1954, only six months after the 1st impression. Book is Near Fine showing light shelfwear to the bottom edges, gilt untarnished, boards are very clean and bright, with a couple of small insignificant spots. 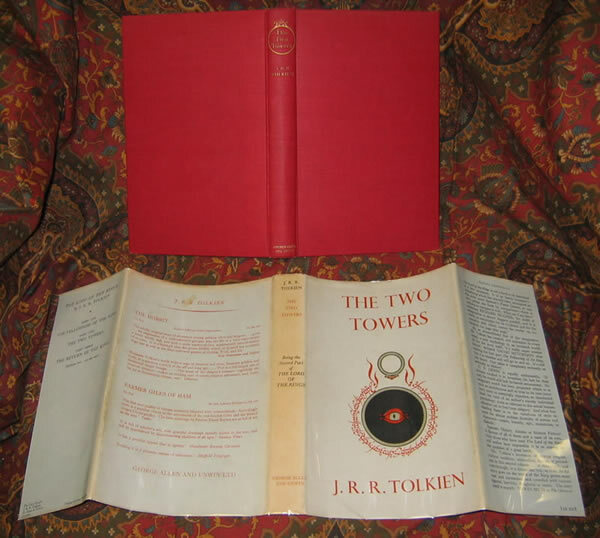 The Two Towers is a stated 2nd impression published 1955, with the date '1955' on the title page. This identifies it as a true 2nd impression, not the 3rd imp. that mis-identifies itself as a 2nd impression, but lacks the date '1955' on the title page. The book is in Near Fine condition, showing very light shelfwear to the lower tips, and some foxing on the front endpapers. 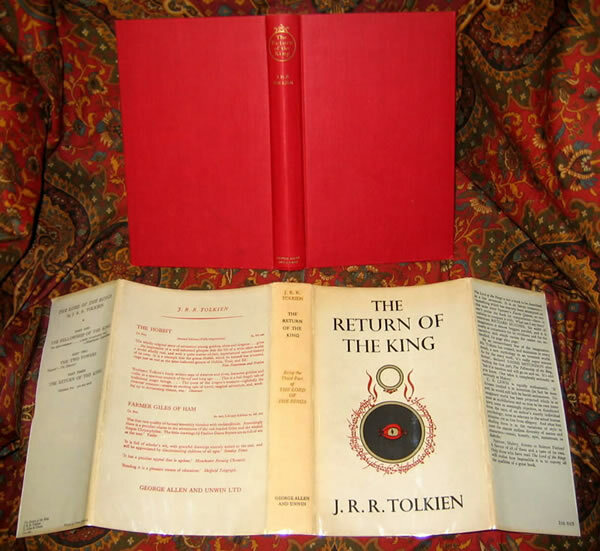 The Return of the King is a 1st impression dated 1955, 1st State as per Hammond and Anderson, with the signature mark '4' and the infamous slipped type on page 49. The book is very clean and bright, showing virtually no wear to the edges. 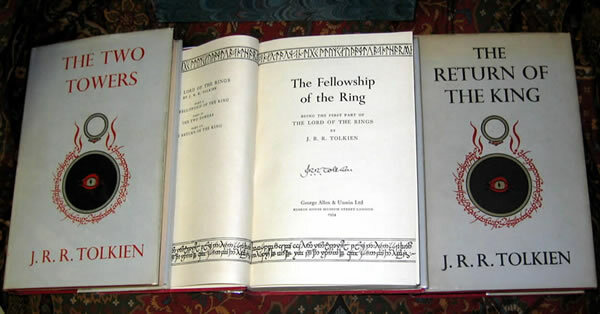 The topstain is faded on the FotR, but is clean and unfaded on the other two copies. All three books are in their correct impression Very Good Plus dustjackets, showing only the lightest mellowing to the spines, no chipping and virtually no loss to the edges. The red lettering on the spines is only lightly faded, but still very legible.These are in beautiful matched condition. 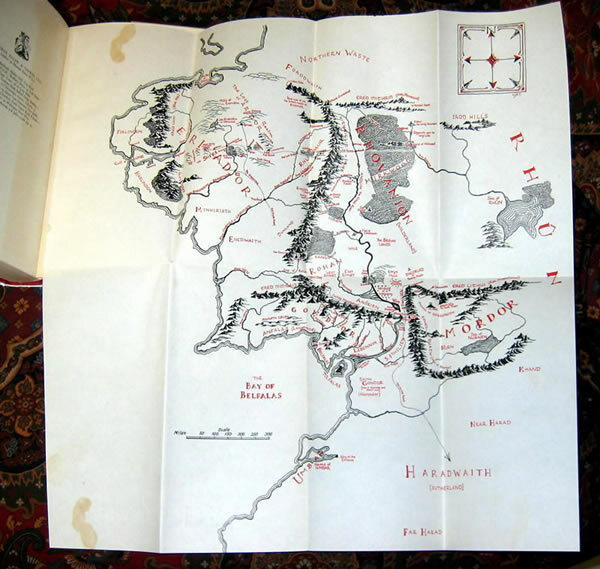 All orignal maps are present and in excellent condition, with the Fellowship's map showing a small liquid stain on the upper & lower blank corners, not affecting the map area's. 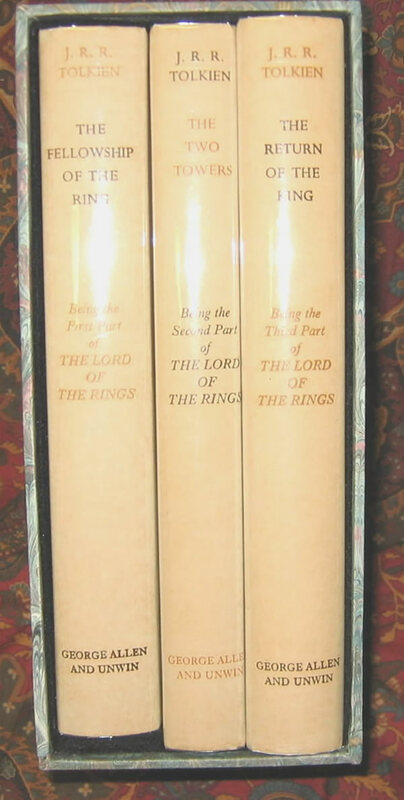 A beautiful Very Good Plus set of first editions of this classic of fantasy literature. A custom slipcase to house these treasures is included in the price. A beautiful matched set, you would be hard pressed to find another this nice, let alone signed by the master.